All MSI AM4 motherboards have new BIOS updates available. The new BIOS includes AMD AGESA Code 1.1.0.1 support for Raven Ridge APUs. Other improvements have been delivered alongside this compatibility update; both memory compatibility and PCIe device compatibility are said to have been boosted. A Reddit discussion is the source of this update news and the same post includes over a 100 comments from various MSI AM4 motherboard users. Most of the comments are positive, regarding the features mentioned in the intro, especially the unleashing of faster RAM speeds, but there are a few that are experiencing issues with RAM voltages. Please check out the official MSI forum for other user comments too. Update AGESA Code 1.1.0.1 to support Raven Ridge CPU. AMD is due to release the Ryzen 3 2200G and Ryzen 5 2400G in the not-too-distant future. With an AM4 motherboard equipped with various video outputs on the back-panel users will be able to make use of on-board AMD APU graphics. 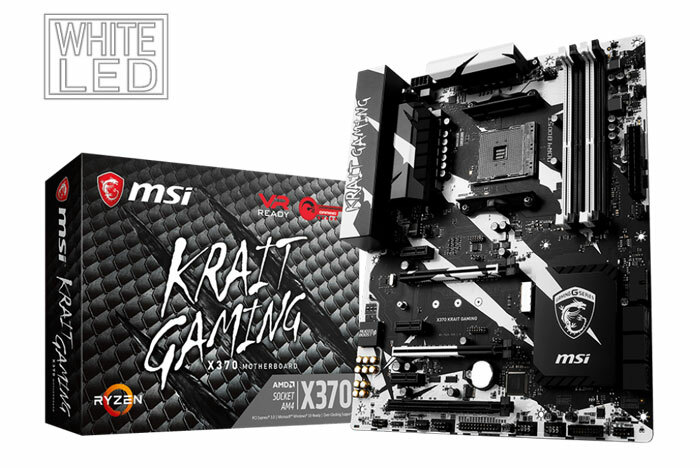 You can use my MSI X370 Krait Gaming BIOS link to find the updated BIOS for your MSI AM4 motherboard: there’s a ‘find another product’ search box at the top of that page. I understand development of them will take longer and cause delays, but its still a bit annoying when presumably the equivalent number of cores and performance will be available in newer ZEN architecture and a GPU for not a huge price hike. Luke7 - depends what you want. If you're looking for an APU (ie. AMD chip with decent built-in graphics) then you'll appreciate the current-gen Vega graphics cores in a competitively price package. If you don't need the vega graphics capability, then you may be better waiting for Zen+ CPUs later in the year. And yes, eventually there will be Zen+ APUs too… but by then Zen2 may be on the horizon. AMD admit that Zen+ is “low hanging fruit” - don't expect radical changes/improvements. In other words, there's always something better in 6, 12, 18 months and at some point you just have to accept that the “current” product is really nice and bite the bullent. Let's be honest, AMD need these APUs out there, as Intel's integrated graphics win them a lot of non-gamer sales simply because of cost/value (no extra GPU required). Right now, AMD's APUs are based on a (six?) year old core and GCN graphics. They badly need Zen+Vega in that space. Remember that every intel consumer CPU from pentium to i7 comes with built-in GPU which is enough for most non-gamers. Suffice to say I'm very glad these APUs exist. But can we have 6/8 core APUs too, please AMD? Installed bios update, some ipmrovements are noticeable.New Lan options appeared.I can run now at 2x16gb at 3066mhz .Also internet speed is very nice.Was laggy lately.